As you may know from reading this blog, we’ve decided to skip FeedDemon 1.6 and go straight to version 2.0, which will be a free upgrade for all FeedDemon customers. Several alpha testers have said that FeedDemon 2.0 meets both of these goals (and is much faster as well), and I hope that you come to the same conclusion after using it for a few days. As you can see from this screenshot, FeedDemon 2.0 is a radical departure from previous versions. In addition to the new single-level treeview (sorry – no subfolders yet), there’s a new “subscription overview” which provides a summary of your subscriptions – including which ones you pay the most and least attention to. The UI has been streamlined, and there’s a new unread feed view which is great for quickly scanning your unread feeds. And throughout FeedDemon, you’ll find a ton of usability improvements that make it easier to work with regardless of your level of experience. Keep in mind that this is a pre-release, which means it’s not done yet! So please don’t download it unless you’re comfortable using unfinished software. 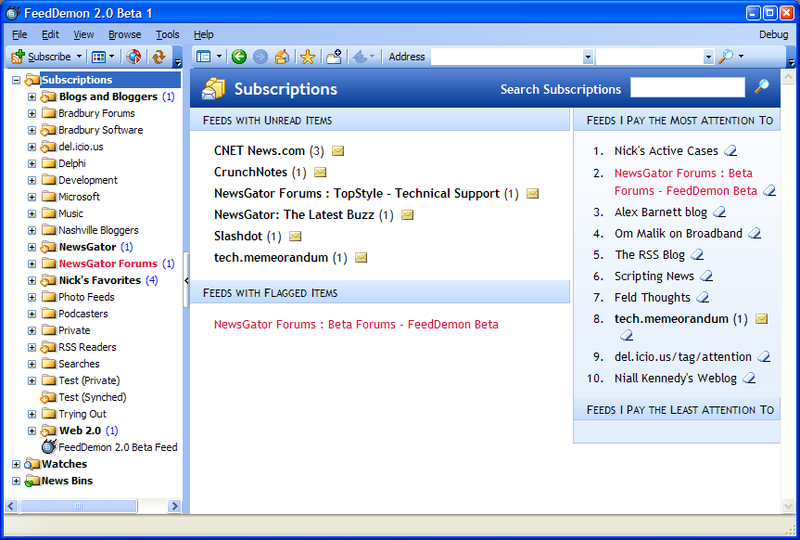 If you do download it and run into problems, I hope you’ll let us know by posting in the FeedDemon Beta Forum. 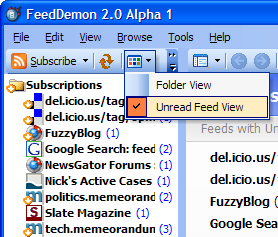 For best results, I recommend installing FeedDemon 2.0 in a separate folder from previous versions. I also recommend backing up your cache folder before upgrading, since version 2.0 uses the same cache folder as version 1.6. To locate this folder, select “Manage Cache” from FeedDemon’s File menu, then click “Explore cache folder” to open the folder in Windows Explorer. If you’re upgrading from FeedDemon 1.5, the new version will give you the option to import your v1.5 cache.